Hi, I would like to report another game with Madrak2, the World Ender. 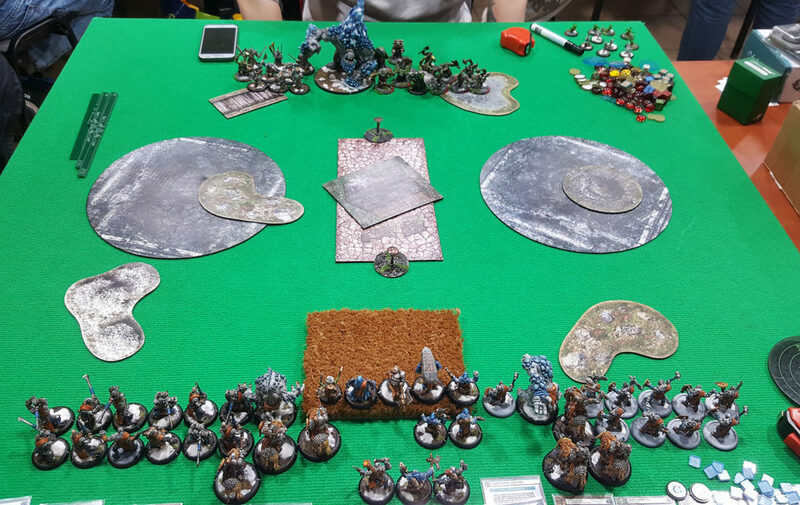 Last Thursday I played against Teciu and his beloved (but fresh in term if list build) Madrak1. So – lets hop into the struggle of two Madraks! I just realized this list is 2 points short, so Swamp Gobbers or a Feralgheist could fit in. In the pictures below Teciu proxied some models with mine, so please note that MK, left Champs, some Whelps and SoB are enemies 🙂 In addtion, it is worth mentioning that those noodles in the middle of my deployment is a field (just concealment with no rough terrain). I won the starting roll and went first. 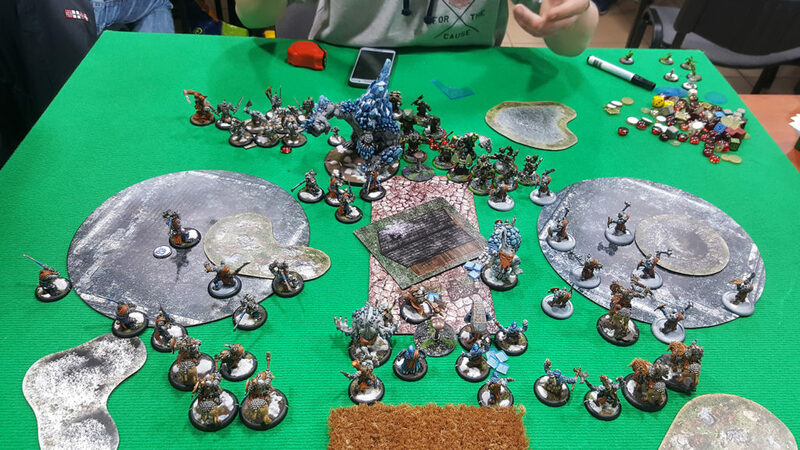 I deploy Fennblades to the left, Kriel Warriors to the right, warlock in the center with beasts and Stone around. Long Riders and support (Fell Callers and Chronicler) went as a second line. Skinners in amush, of course. Teciu went with Champs on both sides and MK slightly to the left, aiming fot the center and left zone. SoB are to the left too, so that zone was heavy guarded. In the first round we both just run, mostly out of threat ranges. 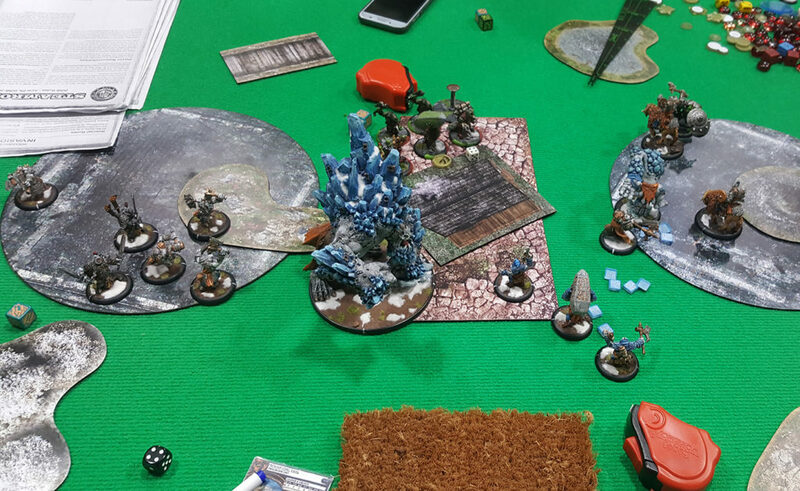 I put Blood Fury on Fenns, Teciu cast Sure Foot. Start of my 2nd turn. Skinner ambush! My second turn. 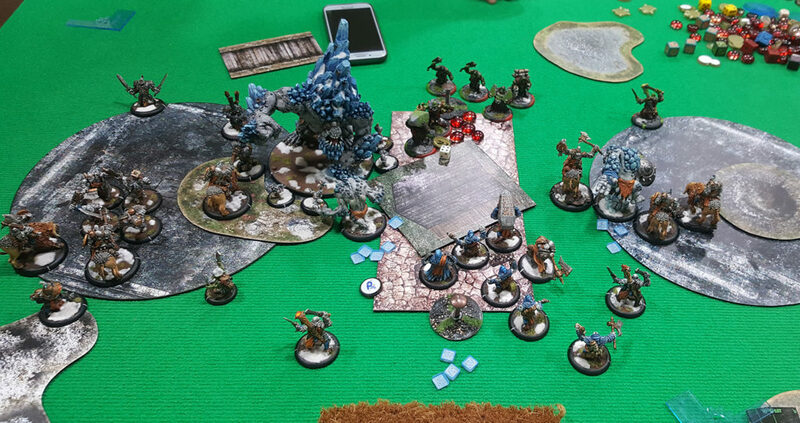 Skinner came from the left, charged Fell Caller in the back arc and killed him. 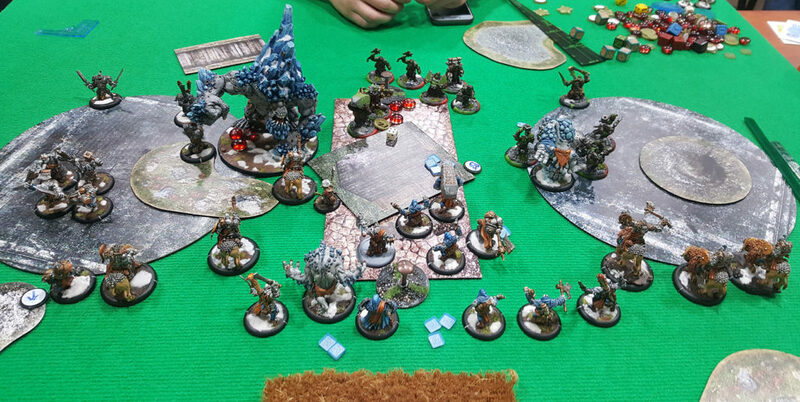 Fennblades got +2 mat from Fell Caller, minifeated and 4 of them charged MK, doing some serious dmg (hot dices involved). MK spat 4 whelps. Warriors run further and jam. Teciu turn 2. Tor used a spray and cleared Fenns next to the MK (I think 1 Champion helped him), Rhudd got rid of Skinner. MK cleared Warriors with spray (if I remember correctly) and killed one Fennblade i n melee. Then he used Kill Shot and sprayed over Fenns in the left zone killing 2 of them and forced tough roll on the Officer. Champs on the right charged and killed 2 more Warriors. Champions rushed forward and killed another Fenn. No points. My turn 3. Skinner came from ambush and run to engage Bouncer. Fenns charged Champions, but they survived on a few boxes (only one was removed). Earthborn, raged by Mauler, on the other side came to Champions and did some dmg to Champs, but he missed some attacks. Chronicler put Charge of the Trolls on Warriors. Fell Caller put +2 mat on them. 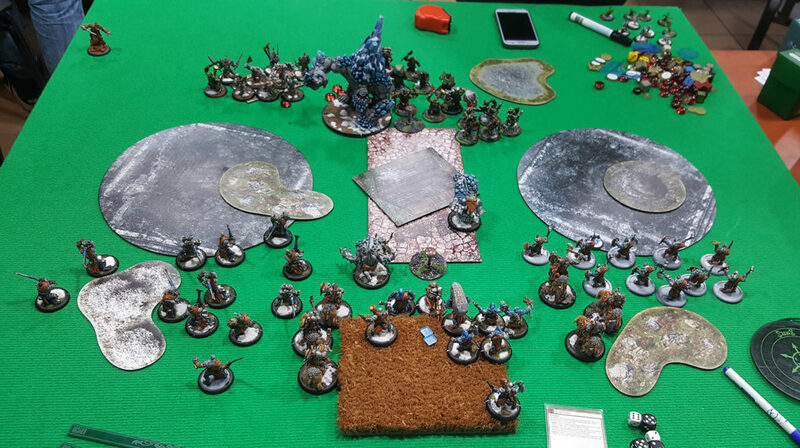 Madrak FEATed, cast Blood Fury on Warriors and they charged Champions, leaving 3 of them alive on 1 box each. If I did not forgot about my feat – they should be all dead… Brain fart 🙂 I also forget to use Warpath to move back Earthborn close to building for additional armour. 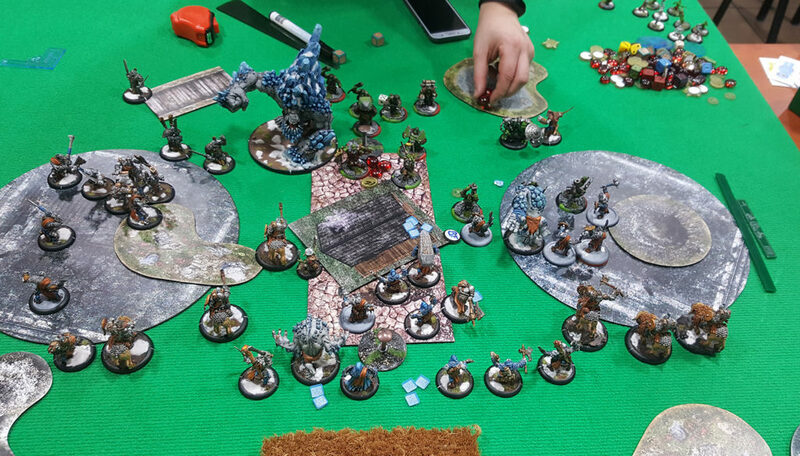 Swamp Gobber run to position to feed Mauler with Warrior next turn (I had 2 more fury than I can handle). Teciu turn 4. Madrak1 FEATed. He healed all Champs to max and MK for a lot (combined with Whelps which healed MK for 12). Fell Caller on the right killed Skinner. Champs heavily dmg Earthborn. Left zone started to collapse under Teciu forces (MK, SoB and 4 Champs). My turn 5. I tried to fight in th left zone without much success. Mauler went for MK, but after all attacks (I miss twice) he still had about 1/3 life and some more whelps spawned. I killed 1 Son of Bragg. I managed to also kill right Champions (1 left) with Buffalos and Earthborn. Teciu turn 5. 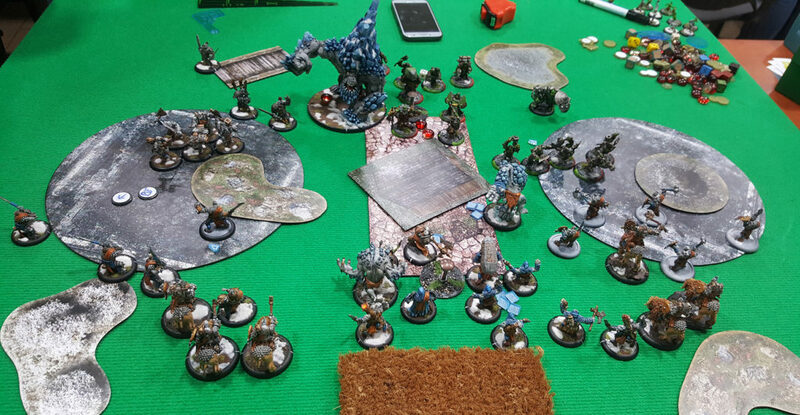 MK killed Mauler and Kill Shot Runebearer. SoB and Champs did more clearing (Fenns Drummer, Fell Caller and Gobber Chef left). Last champion and Bouncer hit Earthborn. No photo here. My turn 6. I killed last Champ in the right zone and slammed Bouncer out to earn point there. I also contested left zone. 1:0 for me. No photo again. Teciu turn 6. Bouncer run to the right zone. Champs and SoB cleared left zone. MK came and destroyed objective. 2:1 for Teciu. My turn 7. Madrak with Blood fury killed MK. Earthborn (with crippled mind) destroyed objective. Long Riders slammed out Bouncer again. Unfortunately I wasn’t able to contest left zone. 3:3. Teciu in his last turn run Bouncer to the right circle and just stayed in left zone. We ended the game 4:3 in Teciu favour. Close game!